Sunday fun day. Well really a sad day. Last day on hook. Last day away from the dock. It has to be done. Time to get serious about cleaning and finishing the boat projects. Up early, and by early this time I mean 4 am. The sound of a boat futzing with an anchor nearby does that to you. Peered out the bedroom window, port hole if you will. It’s 4 feet long so it’s really a window. Noticed a cat had come in. Looked like they tried to pick up the lobster trap but then decided to drop anchor. Kept a close eye on them for a while. When they were content. I went back to sleep too. Last breakfast. Omelette of lots of various treats that needed to be consumed. In no real hurry, content on the ball. Little Internet, then got antsy. Fired up the engines. And the sky got dark. Hmmm. St. Lucia living up to her wet ways. Just a little shower. Let it pass or at least the heavy stuff. Saw a break dropped the ball and off we went. Motoring up the coast getting sprinkled on lightly a couple times. Looking around and there were several boats with the same route and timing. So the race was on, except we were just running slowly. No fishing just hugging the coast and taking in the scenery. 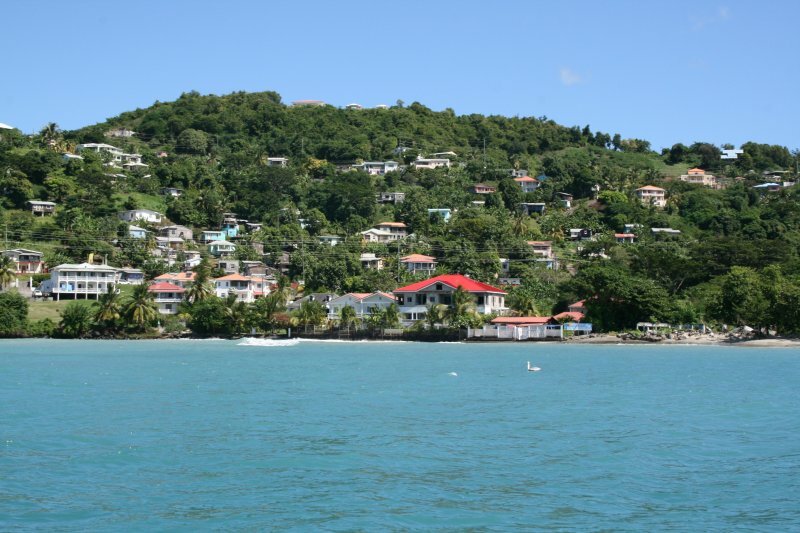 Till we got up to the Marigot and the tank farm. The waves picked up as they rounded the top of the island. Wind on the nose, howling along just shy of 30 knots. Kicked the engines up to 2000 rpm and motored along. It felt as we were standing still, but looking at the GPS were were actually making foreward progress at 5.5 knots. That put us there in plenty of time, it was comfortable so keep on keeping on. 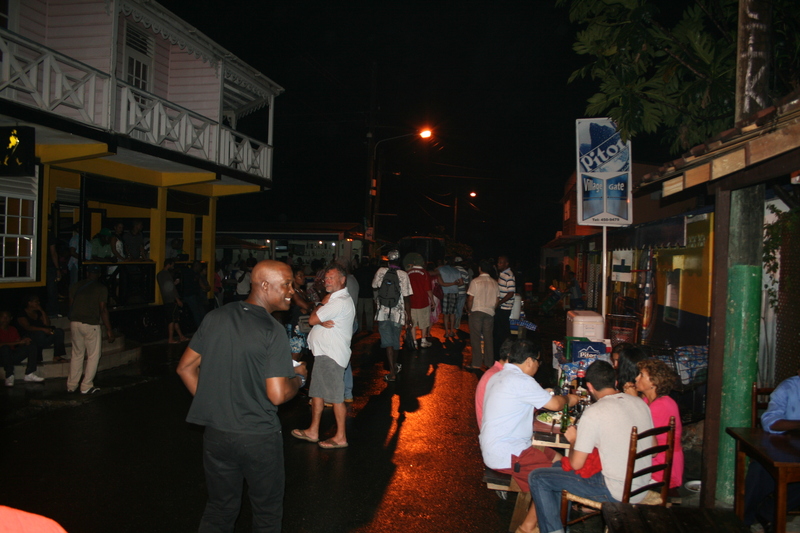 Turn the corner into Rodney bay. The star clipper 5 masted cruise shim was also seeking shelter in the big bay. With a smaller sister ship already there. We cut the corner, between the dive rock and the shore. Dodged a couple out coming boats sailing downwind. Damn if the bay didn’t have waves with white caps in it. Wind was still flirting with 30 knots. It’s got to die down closer to shore. Right? They wouldn’t put a marina in a windy place?!? We still needed to get out our docking gear. Lines, fenders, more lines so Christine asks if she should start getting them together. I say wait till we get up there. The wind would probably blown the fenders overboard. We keep trucking. It’s not letting up. Think about entering the protected waters and rendering up in there after we see what the wind is like in the channel. We get close another boat comes out and immediately anchors. Game time change. Our windless is acting up, but so is Mother Nature. Head to the beach where the chart shows shallow ish water. Drop the hook takes some effort but its down 7/1 scope and its windy. Relax for a bit. Start the fendering process, the wind dies down to 20 knots. I can work with that. 30 mins and we are ready. Fenders ready to kick over lines on every corner, and some in between and others just in case. Start to pull the anchor and we are back at 30 knots. And the windlass over heats at least 5 times. I end up pulling the last 10 meters up manually while Christine maneuvers the boat. Down the channel it’s blowing. Christine calls the marina for our slip assignment. The radio was busy with lots of requests for slips to get out of the wind. Good thing we had a reservation. They said F15. I know which is F pier but not which side is odd or even. We get close. Notice the odd side is down the finger and the dock hands are motioning down that side. Didn’t see the soon enough. Took a route down the back side to turn around. The dock hands saw us and made a call that turning crosswind on the narrow channel in this wind wasn’t a good plan. They found F10 was available. Sweet. Only one turn in 28knots of wind. Turn around. Now. Should we back in or bow in. Back in our escape hatches would be facing the wrong wind direction, but the water and electricity would be right there. 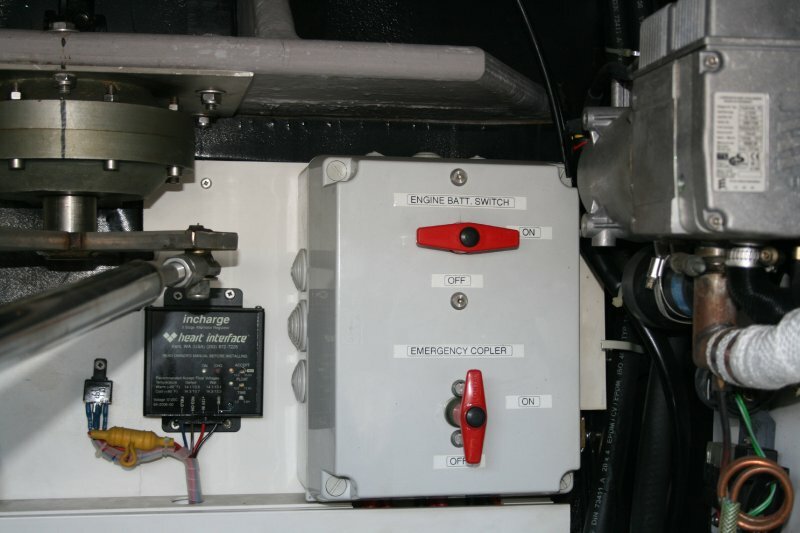 Bow in, put the dock finger on the same side as the engine controls. Bow in won the heated debate I had in my own mind. Stern to is also easier to load and unload. We had plenty of fenders and pulled in without a mark. Tho even after we had tossed the lines we had to throttle up to overcome the wind trying to push us back out. Dock hands remember us and the boat. Hook up water and out electric cord is just short. Start washing. Cleaning. Eventually send Christine to the office to do the paperwork. She brought back a case of beverages. Awesome. Washed the top and front of the boat. 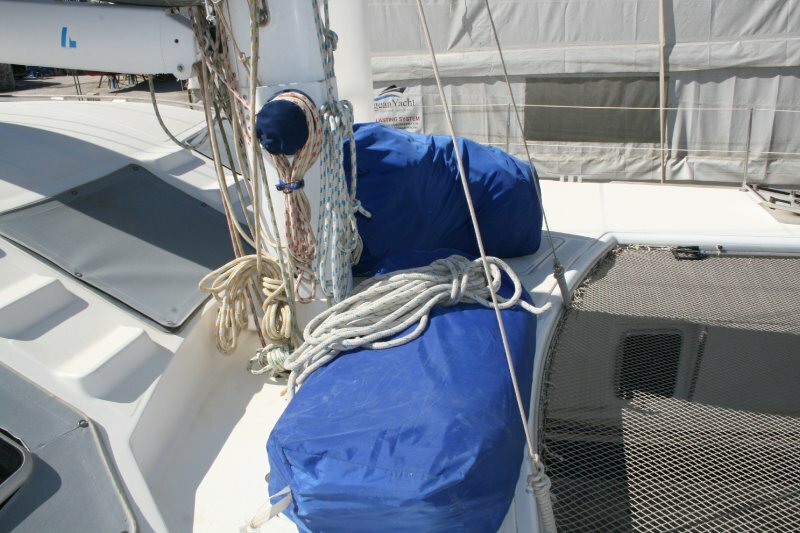 Covered the main sail bag with a bag. Washed the cushions. Christine wiped down the whole interior. Good busy and productive day. Pizza on shore for dinner. This entry was posted in Caribbean on January 5, 2015 by Matt. How is it that I see something at home or on the island or in a store and I think “I have to have that on the boat. It would make “x” so much easier” or “I could store “y” so much smarter”? Then several years later, after removing everything from every drawer, cabinet, closet, and nook and cranny, I realize I had not even used that item once? Of course, with years of being on a boat you come to realize what is necessary and what is not–but occasionally you still have those off moments. I came across these tupperware like containers that stored within themselves, so 8 fit into the largest one and the lids all snapped to eachother. They even had colored dots on the bottom of the tupperware to tell you which lid to use – fancy, convenient, and met our storage limitations. Put them on my Xmas list and received 2 sets (we use a lot of tupperare). 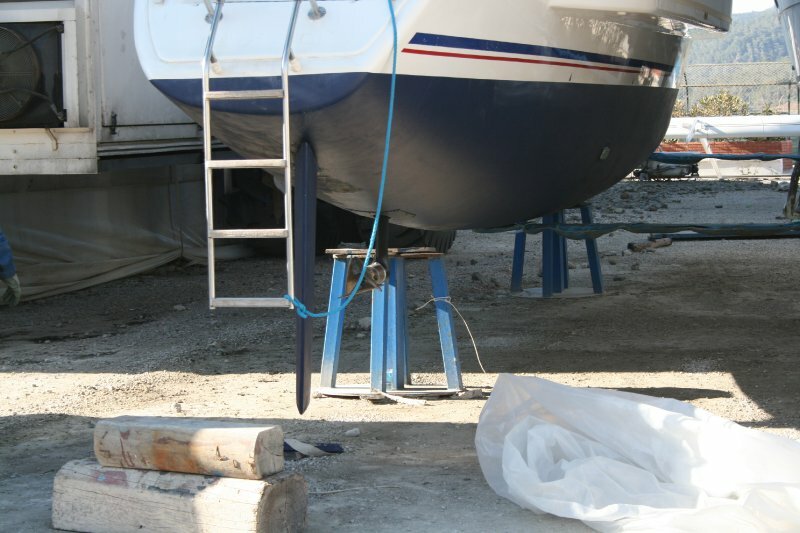 Bring one set to the boat to try it out, so excited and only come to realize that the most important thing they need to do is seal properly and that they didn’t do. It was sort of one of those super weak “I am going to close, but not seal” So sad, back to the Container store they go. In my cleaning extravaganza yesterday, I found parts to a printer we no longer have, staples to a stapler that do not fit, cables to who knows what and many sorts of things that needed to be organized. 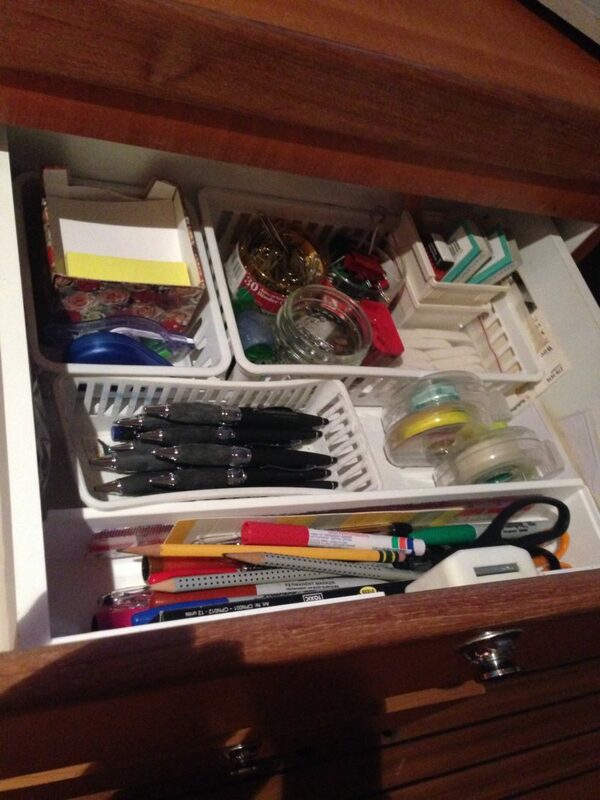 For those of you who know me, you know I love to organize things (sewing drawer, adhesive drawer, fishing drawer, zinc drawer, etc…) it was a nice break between cleaning. Managed to remove 1/4lb of salt from our windows – it likes to accumulate there making it very hard to open and close them and since I’m in charge of readying the boat prior to departure and prior to anchoring/mooring it is good to have windows that open easily. Good day, productive day. Tomorrow and Monday will be super busy, then back to reality. This entry was posted in Caribbean on January 4, 2015 by Christine. Slept in, that means 7am, for those in the central timezone, thats 5am. Getting back to reality is going to deserve a time check, or at least one real late night out. Something to get back in CST time zone. If I show up to work before 9am, they will know something is wrong. 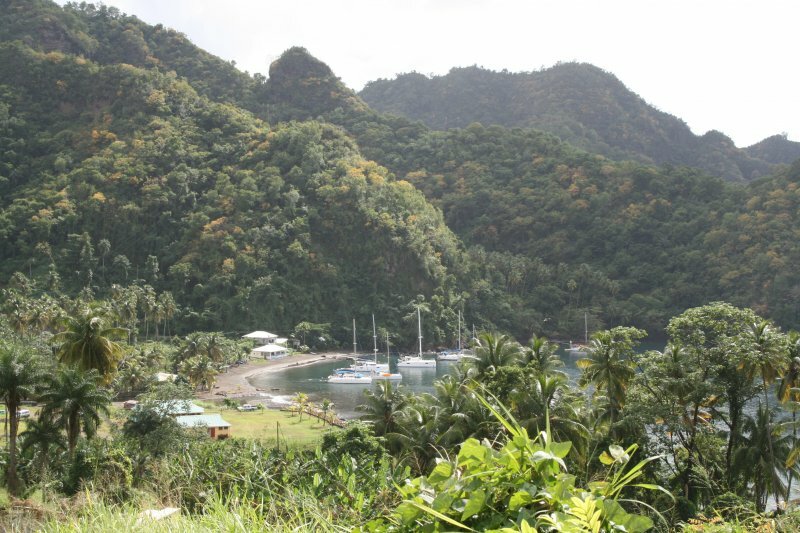 Mooring between the pitons, is majestic and beautiful. Last night’s almost full moon, was spectacular, the reflection on the was water awesome. I think we both watched out the window mesmorized, by the serentity. 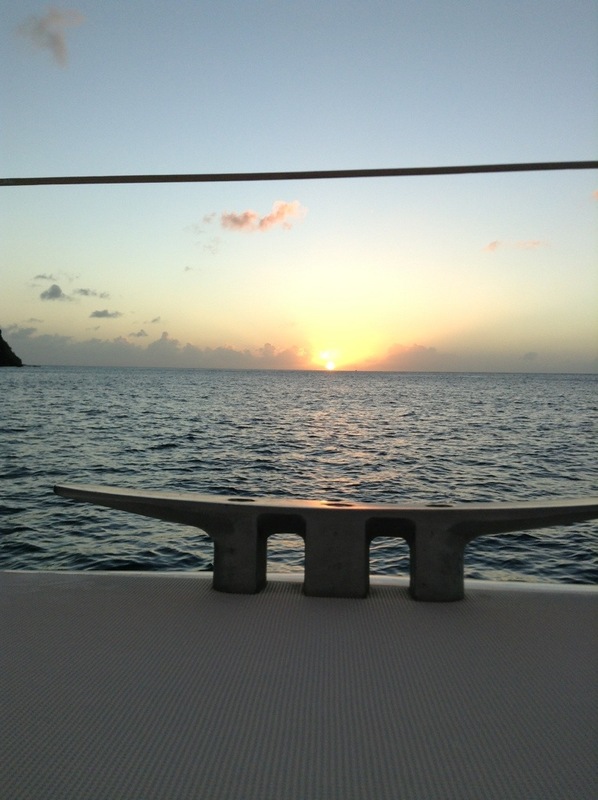 Then the winds over the Pitons, collide with current and we get rolled around on the mooring ball. The bridle creaks, but we have grown to know the creaks as good, that means we are still attached to something. Cool evening. Projects, lets do what we can while we are still away from the dock. Lots going to go on tomorrow and monday, its cooler our here with the breeze. 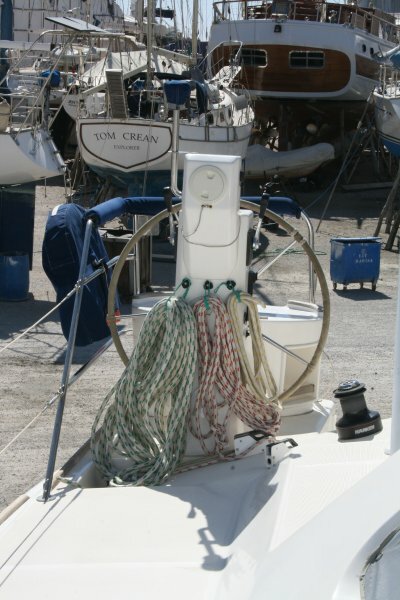 I have a latch project, a boat pole project ( i broke it before we left ) – I can fix it with enough motiviation. Countless others too. Christine has plenty herself, inside, cleaning and wiping down, don’t want extra moisture in the boat when we pack it away. We still have food, just beer and soft drinks are on a very scarce supply. For the first time, I break into the water – body not sure what do with the stuff, but manage to consume several liters during the day. Woke up to what looked to be like a rain cloud, grabbed the bucket put some soap in it, and washed down what I could for hopes of a free rinse. Damn, just a few sprinkles. Work on the latch project, get one almost installed, looked good, fit, worked fine. “Should” not corrode like the crappy original latches on the forward compartments. Course that involves some fabrication and cutting of fiberglass. What would be an easy project when near home, with all the tools we accumulate for various projects becomes a challenge of the wits. Not to mention managing the electrical source. Today was a good sun day, so I had the inverter continuously charging the damn drill batteries. More on that later. 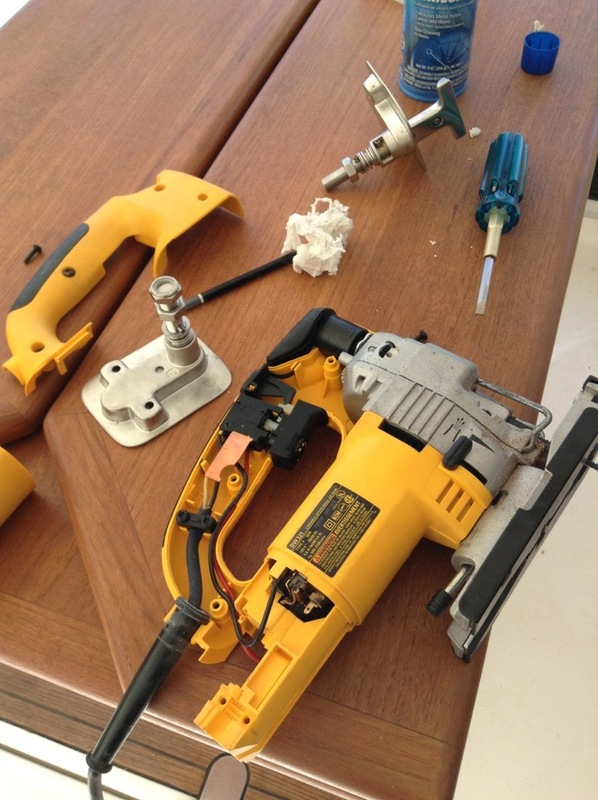 Have jigsaw, sander, and drill on board – most things can be handled with those. Got 1/8 though cutting spacers for the latches, and I break the jigsaw, the trigger switch comes out of its place, so now its ON, or ON. Not good for trying to make corners. Take the next 30+ mins to fix the jigsaw. Back in business, test fit the first latch, Awesome, will work. Just don’t have the rest of supplies to finish any of them anyway. Time for breakfast. Luckily we found all those eggs before xmas, eggs for breakfast. Christine cleaned the whole port side (which includes taking everything out and wiping the walls, ceiling, floors, cabinets, drawers down 3x), while I futzed with one latch, before breakfast. Better omelette making this morning, both turn out good. Continue the latch project, get frustrated, change to the boat hook. Drill batteries charge last all of 48 seconds. On the 7th iteration of charging and drilling, I realize the contacts need some CorrosionX to make the batteries last and drill work bettter. Burnt on my projects its time for a break. Snorkeling sounds perfect, Christine needs another 20 mins, so I find something to tweak that wasn’t on the plan, and we jump into the water. Damn its deep. No wonder we need a mooring here. Dark blue water but we can see the bottom, no way can I free dive to this bottom if we drop something overboard. Find what we thought was a reef behind the boat, turnes out its a boulder, or two, lots of fishies, lots to look at. Check it out, we are all salty, so I suggest we go to the sanctuary by the resort, we always talk about it, and at the time there were no day trippers there. We loaded up in the dingy and headed over there. Chatted with the boat boys and said we could tie to the dock and we walked over and got back in the water. Awesome. Lots of fish, coral that was mostly alive when you got around the corner a bit, shallow enough, saw some pretty blue clam corals that I dove down to check out closer, and one tube coral. No puffer fishes, but lots of rass, huge triggers, angles, rock fish. If it was my first time, probably would have spent many hours there. Aside: There were some new snorkelers that showed up after we got there. Some people are comfortable in the water, others need to relax. Back to the boat, lunch time, tortilla roll up, just like we are home in Texas. I finish the latch spacers, after getting frustrated a few times, and switch to the boat hook project, eventually get the hook “maybe” repaired. Spacers are done, Christine does a huge amount inside. 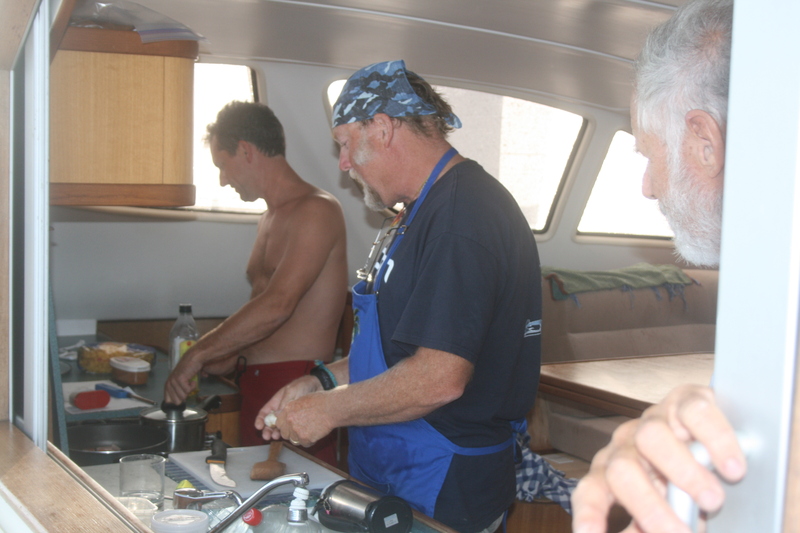 In between the projects, I cleaned up the starboard stainless with Ospho and Christine did the port side. 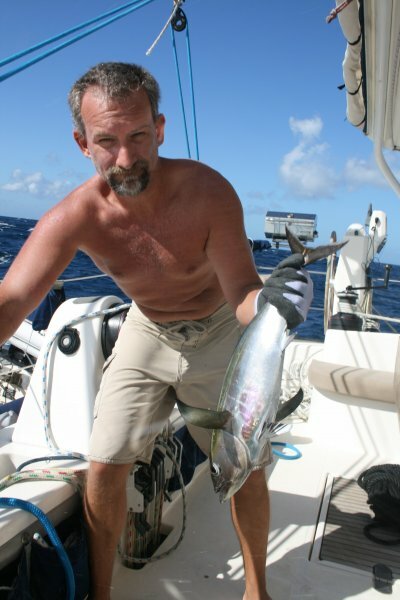 Awesome big Mono hull comes in, tries to anchor once, no dice. 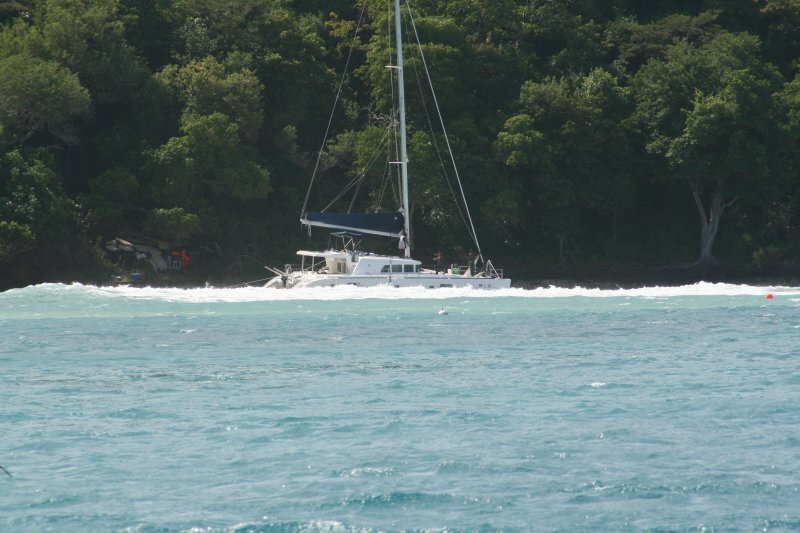 We perv out, 4 crew members on the 60-70 footer? Second try they seem to be hooked, course within 100 feet of us. Fruit/Veggie boat boy hits em up, and scores big sales. Its close to sunset. Time for a fresh coldie. Find the bow, as the position to watch the sunset, just before dinner. You’d think we’d be running low, but we still have food since Grenada. We did pretty good, have 1 more ‘grill’ outting, a little lunch meats, some eggs after tonights steak and porkchop/green bean/corn on the cob/salad dinner. Yeah, okay we had a big dinner. 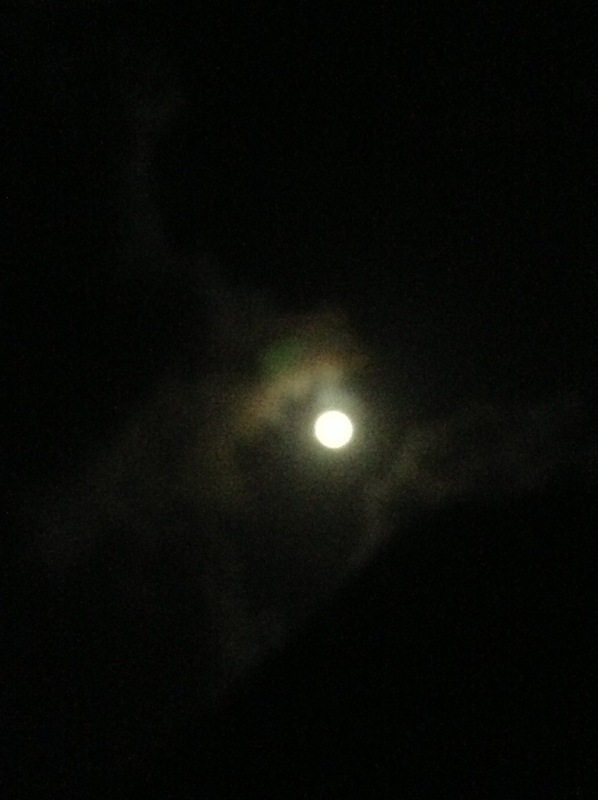 Almost a full moon, pictures don’t do it justice, but its awesome here. Showered and a Rum N Diet, under a full moon, which reflects over the water. DAMN why do we have to go back to reality? Oh well, 20ish miles tomorrow in the lee of the island, means a motor, its sunday, most stores will be closed when we get there. A load of laundry, we need to refill the propane for next trip. Wash the boat and prepare to leave it for a few months. So much more spectacular in person. Lights up the entire ocean. 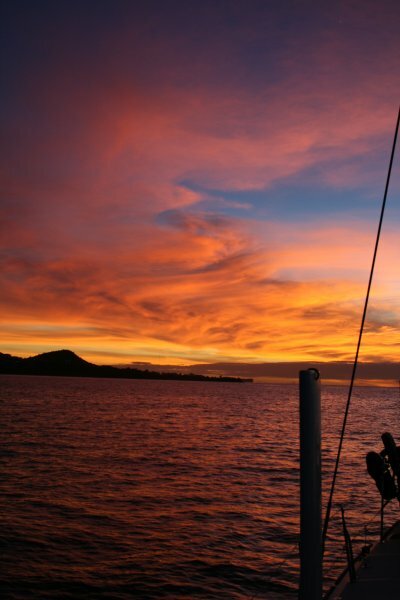 This entry was posted in Caribbean on January 3, 2015 by Christine.